If you're looking for holiday fun, there's no end to it in the Virginia Beach/Hampton Roads area--ranging from colonial-themed events, Santa-in-the-sand and Scuba Santa events, to holiday planetarium shows, ice skating, and amazing holiday light shows-- including the only time of the year you can actually drive on the Virginia Beach Boardwalk. CHECK BACK LATE OCTOBER TO SEE A LIST OF 2019 EVENTS AND DATES! Discounts, deals, and tips for visiting Busch Gardens Christmas Town! Snow, Santa, shows...and roller coasters? Head on over to Busch Gardens Williamsburg's Christmas Town, a family-friendly winter wonderland of excitement, featuring rides, holiday-themed shows, Christmas shops, and holiday-themed yummies. The snow may be fake (or then again, maybe not depending on what kind of winter this is), but the fun is real! For details and the latest ticket discounts, go to our Christmas Town page. Santa...in the sand? 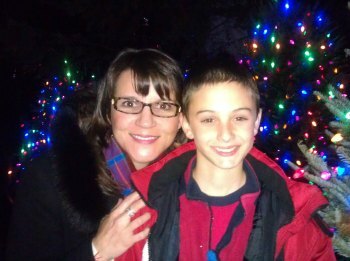 Sponsored by Maola Milk, Holiday Lights at the Beach is a magical family fun attraction. Located at the Virginia Beach Boardwalk, it's the perfect way to start the holiday season. Click here for more Holiday Lights at the Beach info, including the cheapest days to visit and how to get military discounts! This show combines holiday fun, science, religious history, and music to explore the story of the Star of Bethlehem, which led the wise men to Jesus' birthplace. Was it a planet, a comet, a supernova, or just a miracle? Daytime shows are $4 (plus museum admission) and take place on select dates. They also offer evening shows (for $6) on select dates. For more information, call 757-595-1900 or go online at http://www.thevlm.org/. Here's why my children "flip" for horseshoe crabs at the museum. The seaside town of Yorktown celebrates Christmas through the month, kicking off with a Nov. 30 Fife and Drums concert at the Victory Monument at 7:00 pm, an Illumination and a Christmas Tree Lighting at 7:30 pm. The next day, they will have a Christmas Market along Main Street from 10 am to 3 pm and a lighted boat parade at 7 pm. For more information, call 757-890-3500. The events continue throughout the month, including Breakfast with Santa and a Holiday Marketplace on Dec. 8, a "Wreaths Across America" event on Dec. 15, and a Christmastide in Virginia exhibit at the American Revolutionary Museum at Yorktown Dec. 14-31. A wonderland for kids and kids at heart. Holiday fun and lights, a kids' maze, a live animal nativity and petting farm, marshmallow roasting, cider, and bonfires. Admission is $7 per person. Children under 2 are free. For details, go to www.huntclubfarm.com. Remember what it felt like going to see Santa arrive in his sleigh? Feel like a kid again at the Annual Holiday Parade at the Beach! Join tens of thousands lining the street to ring in the holiday season. Marching bands...fire engines...cool floats...and huge balloons from New York's Macy's Thanksgiving Parade. It all starts at 5:30 pm along 15th to 25th street along Atlantic Avenue. For details, go to beachstreetusa.com. Get into the places you've always wanted to see! Includes five locations in the Historic Area not usually open to the public-- including the Red Lion and Blue Bell, the Alexander Craig House, Powell's Kitchen, the John Crump House, Bruton Parish Rectory, and Ludwell Tenement. Hours are from 9:30 a.m.–5:30 pm. Tickets are $30 in advance. For details, go to www.history.org. The one and only! Your chance to see Colonial Williamsburg literally "light up" as the attraction welcomes the holiday season with candles, music, and a fantastic fireworks display. Starts at 5:15 pm, with fireworks at 7 pm. No admission fee, just come to Duke of Gloucester Street. For details, go to www.history.org. 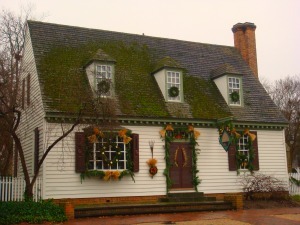 Holiday decorations at Colonial Williamsburg. Celebrate Christmas past as you experience 17th- and 18th-century holiday fun and traditions. At Jamestown Settlement you'll see a film and take a guided tour focusing on English Christmas customs and their place in the early Jamestown colony. Meanwhile, the Yorktown Victory Center will show you how soldiers kept the Christmas season alive in their military encampments, as well as show you how Christmas on an early 1800s Virginia farm. Jamestown Settlement and Yorktown Victory Center. Admission is $20; kids under 6 free. Go to www.history.org and check their calendar for details. Celebrate New Year's Eve with a cruise on the lovely Spirit of Norfolk, featuring a lavish buffet, musical entertainment and dancing, and view of the Navy' s Atlantic Fleet. For details, go to www.spiritofnorfolk.com. This family-friendly holiday fun event features animals from Teeny Tiny Farm, carnival-type games and prizes, face painting, and more. The event takes place from 11 am - 1 pm. There is an additional fee (besides regular admission) for some activities. For details, go to thevlm.org. Looking for some sample itineraries for fun during the holidays? 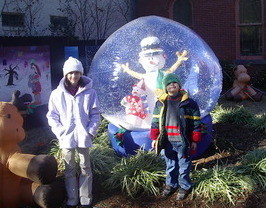 Check out my Holiday Itineraries page for three sample itineraries the whole family will enjoy. If you're looking for holiday events before Christmas, check out my November Holiday events page. And if you're looking for Busch Gardens Christmas Town, click here.